The advertisements for the treatment of balding and hair loss in men can't be missed. These ads might lead one to believe that hair loss is generally an issue affecting men. However, the fact is that as many as two-thirds of all women experience hair loss at some point. Does Estrogen Affect Hair Loss? The role of estrogen in hair growth—at least in humans—is not clear. Both oral and ​topical estrogens are prescribed by physicians to treat hair loss in women, although there are no controlled studies to support this use of estrogen. Dr. Vera H. Price, a researcher who examined hair loss and treatments for the two most common types of hair loss—androgenetic alopecia and alopecia areata, warns that women who choose to use oral contraceptives to treat hair loss should take care to select one with little or no androgenic activity, such as norgestimate or ethynodiol diacetate. She also warns that women with androgenetic alopecia should not use testosterone or androgen precursors such as DHEA. Alopecia areata is an immune disease that affects almost 2% of the population in the United States. This type of hair loss appears in various degrees of severity – from small, round patches of hair loss that regrow without medical treatment, to chronic, extensive hair loss that can involve the loss of all hair on the scalp or body. This type of hair loss affects both genders equally and can occur at any age, although it occurs most often in children and young adults. Treatment of this type of hair loss includes therapies such as glucocorticoids, topical immunotherapy, anthralin, or biologic-response modifiers, such as Minoxidil. The choice of treatment depends on your age, as well as the extent of hair loss. Milder cases often see a greater improvement with treatment than severe cases. In no case does treatment restore full hair in patients with 100% scalp or body hair loss. Androgenetic alopecia in men is what is known as male-pattern baldness—hair loss that starts at the front of the scalp and recedes backward over time, and hair in the center of the scalp thins and falls out. In women, this instead results in uniform hair thinning. Women who develop androgenetic alopecia may be suffering from polycystic ovarian syndrome. There are several misconceptions about this type of hair loss, so let's dig into them more closely here. Myth: Hair loss is inherited from your father. Fact: Both parents&apos; genes are a factor. Androgenetic alopecia is genetically-linked hair thinning. 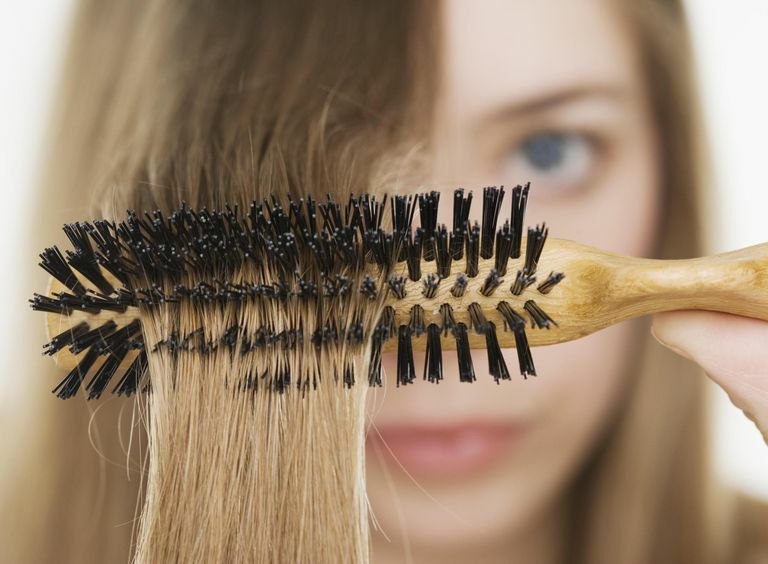 Myth: Female pattern hair loss causes abnormal bleeding. Fact: Menstruation is not affected. Hair loss typically begins between the ages of 12 and 40. Myth: Extensive hormonal evaluation is required. Fact: Hormonal evaluation is only required if the patient is also experiencing irregular periods, infertility, hirsutism, cystic acne, virilization, or galactorrhea. Androgenetic alopecia usually doesn&apos;t cause menstrual issues or interfere with pregnancy or endocrine function. Myth: Teasing, using hair color, other products, or frequently washing hair increases hair loss. Fact: Normal hair care doesn&apos;t affect hair loss. The only drug approved for promoting hair growth in women is Minoxidil. What Are the iPledge Requirements for Men and Women?